NEW YORK—Microsoft previewed the next version of Windows 10 on day two of its Build developer conference in Seattle. One surprise, and this is a big win for Microsoft, is how chummy it has gotten with Apple. Exhibit A: iTunes and Apple Music will be coming to the Windows Store by year end, and Microsoft is generally making it easy to shuffle content from Windows to other platforms. With the upcoming Fall entry, Microsoft hopes to build on its vision for Windows, notably to empower the creator in all of us. While the company wouldn’t say when this latest version of its ubiquitous operating system will arrive, the software’s very name supplies as good a hint as any: it’s dubbed the Windows 10 Fall Creators Update. The software is a follow up to the current Windows 10 Creators Update, which only started rolling out to the more than 500 million global Windows 10 devices out there last month. According to Microsoft, more than 300 million people now use Windows 10 daily, for more than 3 1/2 hours a day on average. 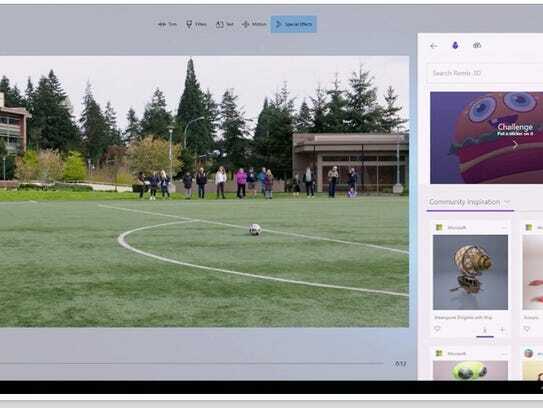 On the creative side, there’s a new Windows Story Remix app in the Fall update, which leverages artificial intelligence and machine learning to help you turn your pictures and videos into stories. You’ll be able to apply cinematic transitions, change themes and the soundtrack, and add 3D objects to turn your story into a mixed reality masterpiece—well, that’s Microsoft’s hopeful reality anyway. Mixed reality in general is part of Windows moving forward, and Microsoft showcased some of its upcoming Mixed Reality headsets, including an Acer bundle with newly-announced motion controllers that will cost $399 during the next holiday season. Microsoft gave developers a look at other new Windows 10 features. There’s a cloud-based OneDrive Files on Demand feature that lets you access such files without downloading them onto a physical computer. A Timeline feature will let you visualize the files, apps and websites you’ve previously engaged in, so that you can easily return to those experiences. You can also pick up where you left off via a Cortana feature that lets you do just that, not only on other Windows machines, but on iOS and Android devices as well, presuming you’ve got the Cortana app running on those devices. It is likely to remind Apple aficionados of the Handoff feature. Yet another feature in which Windows makes nice with iOS and Android is the Clipboard. You’ll be able to copy and paste files off your PC and onto an Android phone or iPhone. And Microsoft is promising the full iTunes experience when iTunes comes to the Windows Store by the end of 2017. That means Apple Music, the iTunes Store and full support for the iPhone and other Apple devices. The absence of iTunes had been one of the biggest voids in the Windows Store. And its arrival there may be particularly important for students thinking about getting the Surface Laptop or other computers that will run Windows 10 S, the education-focused version of the operating system that Microsoft launched earlier this month. The reason: the only third party apps that run on Windows S PCs must be downloaded from the Windows Store.